The UltraBac Installer allows UltraBac to be installed on either the local system or to remote systems. A full install, copying additional binaries, should be performed on the backup host. Then any necessary agents (or a recommended full install) can be installed to the remote systems. Running the full installation on the host machine will allow the backup of remote files, SQL databases, Exchange servers, or a full "Image" backup of the local system. UltraBac agents can be installed on remote systems to allow the backup of their Active Directory/System State, and Image backups of their physical disks. UltraBac device controls can be installed to allow the use of remote tape devices, including media libraries. 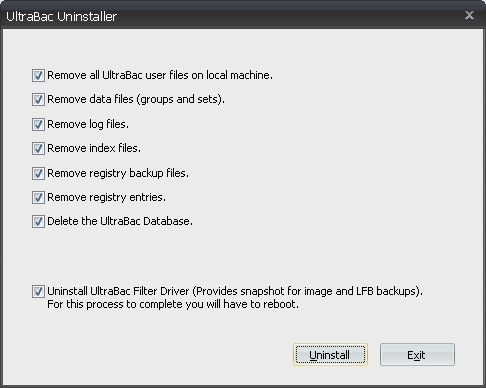 NOTE: During both the installation and uninstallation of UltraBac the program will prompt for the system to be rebooted in order to install/uninstall UltraBac's Locked File driver. NOTE: The UltraBac installer will automatically launch the ".Net 4.5" installer, for operating systems other than Server 2003, if ".Net 4.5" does not already reside on the system and an agent being installed requires it. For Server 2003, UltraBac will install ".Net 4.0." On older hardware or within virtual machines, the ".Net 4.5" installer is very CPU intensive. For these systems it is recommended that ".Net 4.5" be manually installed PRIOR to the installation of UltraBac. The ".NET 4.5" installer can be found within the downloaded .zip file in the "ubinstall\dotnet" folder. Launch the "dotnetfx45_full_setup.exe" to manually install ".Net 4.5." The ".NET 4.0" installer can be found within the downloaded .zip file in the "ubinstall\dotnet" folder. Launch the "dotNetFx40_Full_x86_x64.exe" to manually install ".Net 4.0." Download UltraBac and unzip the contents of the downloaded .zip file to a temporary directory. Double click on the "Launcher.exe" in the temporary directory. Fig. 1 - Launch screen for the UltraBac Installer. Check box to copy binary files for optional CPU architecture. Necessary to deploy UltraBac in a mixed architecture environment and to build UBDR for additional architecture. Fig. 2 - Copying additional binaries. 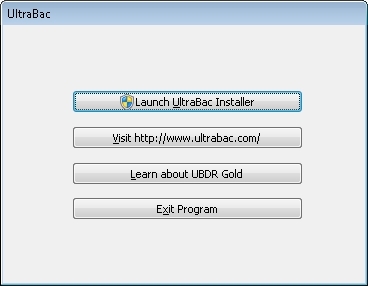 Click "Next" in the "UltraBac Installer" screen. Read the UltraBac Licensing Agreement text, and check "I accept the terms of the licensing agreement." Review the list of components in the "Setup Summary" and click "Next." Type the account name to be used for backup in the "Account Information" \ "User:" field. Fig. 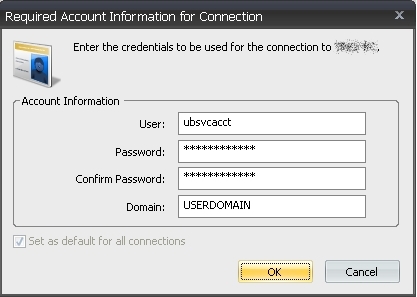 3 - Entering account information into UltraBac. Type the password into the "Password" field. Re-type the password into the "Confirm Password" field, and click "OK."
Type the account's domain in the "Domain" field. When installing in a workgroup, leave this field blank. Checking "Set as default for all connections" will instruct UltraBac to use the specified account to run all scheduled backups as this user. Ad hoc backup jobs and restores are run as the currently logged on user. After the initial installation completes, the UltraBac installer will give the option to launch the UltraBac Management Console or the Remote Installer. The Remote Installer can also be launched from the Windows Start menu or from the Management Console via "Tools"/"Deploy"/"Install UltraBac." Click "Next," ignoring "Install Options." Accept the EULA by checking "I accept the terms of the licensing agreement." Select "Install to machine(s)" and click "Next." Fig. 4 - Setup options. Click the "Add New" icon, type or browse to the name of the client system(s) to be installed, and after adding all of the systems, click "Next." Fig. 5 - Selecting systems for installation. Select the install type, and click "Next." Review the list of components in the "Setup Summary," and click "Next" to begin the install. Install to other machine(s) – Install UltraBac to a system on the network. 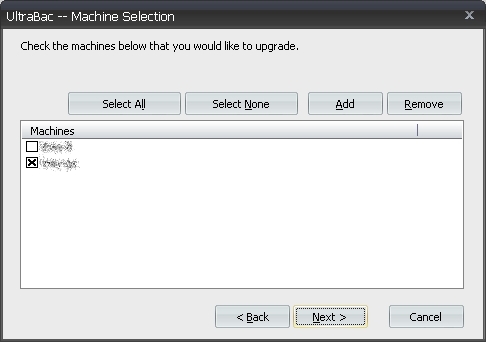 Upgrade managed machine(s) – Upgrade all systems in the Managed Machines set in the Manage tab, under "Managed Machines," to the version installed on the Remote Installer host. Replicate Account Information – Replicates all account information set in the Manage tab, under "General" / "Authentication options" / "Accounts," to each system being installed. Copy License Server Information – Replicates the licensing server information set in the Manage tab, under "Licensing" / "Set License Server," to each system being installed. 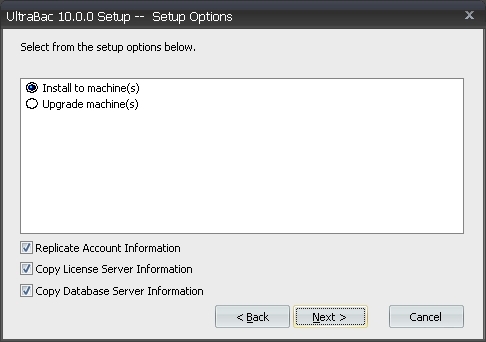 Copy Database Server Information – Copies the database configuration set in the Manage tab, under "Database" / "Database Wizard," to each system being installed. When performing the initial installation of UltraBac on the backup host, all components should be installed using the "Full Install" option. This will allow all agents and options to be used and controlled from the backup host. If installing UltraBac into a mixed 32/64-bit environment, check "Install files for other platforms" and check the applicable platforms. This will not install those files, it will make them available for remote installation to other platforms. UltraBac automatically installs the files for the system's platform. Fig. 6 - Copying 32/64-bit binaries. Highlight the UltraBac entry in the "Add/Remove Programs" window and click "Change/Remove." Fig. 7 - Uninstalling UltraBac. Check "Remove all UltraBac user files on local machine" to completely remove the entire application, including sets, groups, online indexes, registry entries, and ALL other application information. If "Remove all UltraBac user files on local machine" was not selected, open the registry editor and browse to "HKEY_LOCAL_MACHINE"\"SOFTWARE." Delete the "UltraBac Software" key. NOTE: If the UltraBac Database has not been installed, the option "Delete the UltraBac Database" will not appear in the list.